Tasting Grand Cru Chambertin next to other wines is like seeing a film featuring Anouk Aimée after an all-day marathon of Friends. It has such a different affect on the senses it makes you wonder whether all winemakers are using the same key ingredients of grapes, soil, sky and cellar. The last time I tasted 2008 and 2009 Grand Cru Domaine Rossignol-Trapet they were in an embryonic En Primeur state in London; now the wines had formed a clear personality. Rossignol-Trapet’s Gevrey-Chambertin villages red was a go-to wine for me for a couple of years, so it was a thrill to meet Nicholas at the Domaine. Nicholas is a quiet man and speaks through opening the wine, which in turn, speaks through the soil: the fact is, only someone who has a deep, intimate connection to the land can explain the particular cool western winds down the slopes of Latriciéres-Chambertin and you can actually feel it before you in the glass. I could tell you how Rossignol-Trapet moved to biodynamic winemaking in 1997, or that he was one of the first biodynamic winemakers in Gevrey-Chambertin, or that his family have long associations with the area dating back to the 16th century. Gevrey-Chambertin is often described as fuller-bodied and meatier than other appellations in the Bourgogne, but the Grand Cru are, in my opinion, where the obvious tasting notes drop away, and only blue skies from a hillside remain. The 09 Le Chambertin Grand Cru is beautiful but still closed. Smoky, tobacco, excellent tannins, very pale ruby throughout, not as open yet – needs another 15 years. The 2009 Chapelle-Chambertin Grand Cru is more powerful and full-bodied with great fruit density. My intensely favourite wine was 2009 Latricieres-Chambertin Grand Cru. Again, tender, soft wines with no fining, very silky rose, tea and cinnamon with layers of forest floor after rain, leather and bruised overripe strawberries. My notes say, and admittedly, not too originally when talking about Burgundy, but it has to be said because it is my honest response: “Ethereal.” It belongs in that small group of wines that have the same affect as seeing something so beautiful it involuntarily brings tears to the eyes. 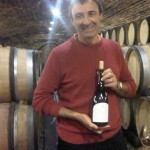 This was the last tasting in Burgundy before heading for the Eurostar; the effect lasted all the way back to London. But that’s Grand Cru Chambertin for you. Nothing else remains. Do you love Italian wine? Why not visit my other website, Vinissima – for all the news and tastings in London.